That’s what Lori Capener says when she talks about Geoff Thatcher today. Many in the attractions industry first learned the ropes in various facets of park operations in their student years, and from age 14, until his graduation from Brigham Young University with a degree in journalism, young Geoff worked at Lagoon Amusement Park in Farmington, Utah. He embarked on a newspaper career, but missed the world of the park. “I was used to a place where people were happy and wanted to make others smile,” said Geoff. 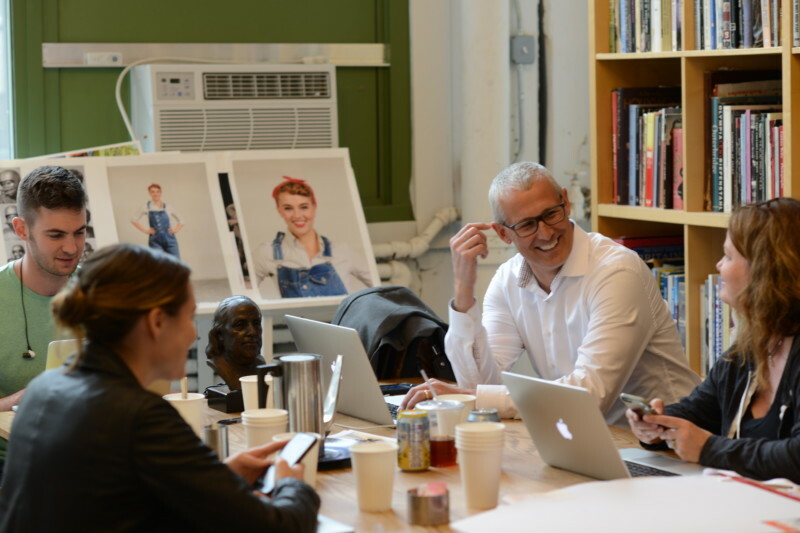 ABOVE PHOTO: Geoff Thatcher working with producers from The Brand Experience at StudioEIS, a sculpture studio in Brooklyn in May 2017. Geoff launched his own company, Creative Principals, in July 2017. Photo Credit: Elliot Schwartz. It had gotten into his blood. Geoff has a knack for creating long lasting relationships, and in the years since leaving Lagoon, has remained in close touch with Capener, who recently retired as art director of the park, and was Geoff’s former supervisor. She and others from the park administration have followed Geoff’s career with interest. They weren’t all that surprised to see him move out of journalism and take his skills back into the industry that had won him over. At least some of these qualities – along with his affection for the industry – showed through when, for a Cincinnati paper in 1994, Geoff interviewed Keith James of Jack Rouse Associates (JRA) for a story (James is now president and CEO of the company). That meeting led to a job offer. Geoff stayed seven years with JRA, and his last title at the company was senior writer and producer. At Lagoon, Geoff had absorbed everything he could about the operations side of amusement parks; at JRA, he would be exposed to the creative side of the business at one of the top design firms in the industry. It was a time when “story first” became the rallying cry of themed entertainment; when storytelling was recognized as the primary driver for the creation of visitor attractions. 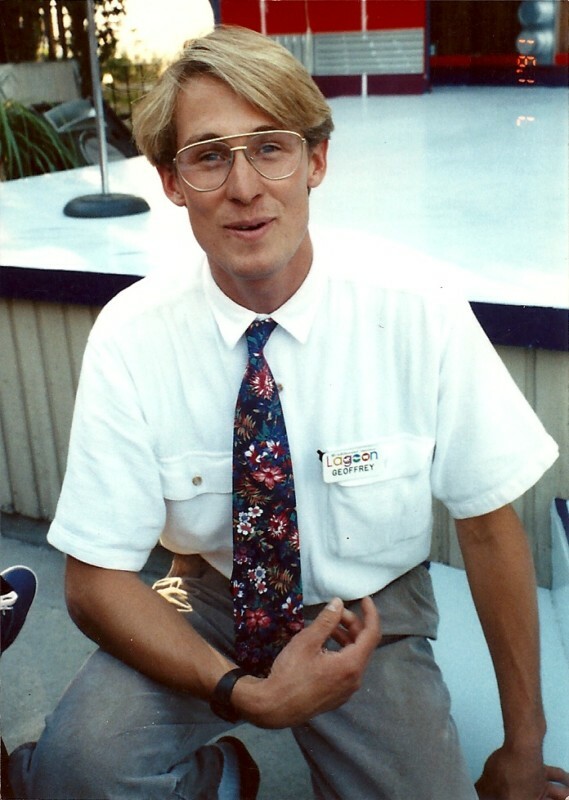 Geoff, as a 22-year-old stage manager in the Entertainment Department at Lagoon Park in Utah. Photo courtesy of Lagoon Park. By 2008 – and after a brief stint working on the opening ceremonies of the 2007 Rio Pan American Games as a video producer – Geoff was executive creative director of The Brand Experience. He stayed there until June 2017. Now, as founder and Chief Creative Officer of his own company, Creative Principals, Geoff is poised to continue on this path. One of Geoff’s key strengths is the pitch. “The pitch and the presentation are something I excel at and love to do,” he said. “I love to go up against the best in the industry – I love the experience whether I win or lose (but of course I most love winning). I find it joyful, and on a personal and professional level, it’s just very rewarding to do this work. My strength is in creative leadership. I’m a big fan of words and meaning – I am a writer, storyteller, creative director, and art director who works with designers. The reason my company is named Creative ‘Principals’ is that a principal is a leader – someone who excels at what they do. If you have a project that needs creative leadership, that’s where I want you to call me. I can put the team together and bring the pitch. My career is about taking projects from concept to reality. The Center reopened in 2015 with an event for the Surgeon General. “We are more than competitive now,” says Montgomery. “It helps us share what we’ve learned and engage in bigger conversations not only around healthcare delivery but the big picture of health. We are reaching the next generation of healthcare leaders, and more than 95% of visitors rate us highly.” The 15,000-square-foot facility is receiving more than 5,000 visitors and hosting more than 200 meetings a year. “Story first” clearly worked for this client. “Get your message down, get your story straight and then figure out the right way to engage people,” said Montgomery.